This work explores the mutability of personal history through interactive public sculpture that allows visitors to ‘mix and match’ elements of the personal histories of real people in the culturally significant and historically rich community of Gorham’s Corner in Portland, Maine. History Table at the Cannery property thus serves as a touchstone to the history of the site and the memory of 24 individuals who lived and worked in Gorham’s Corner during the years 1850-1910. 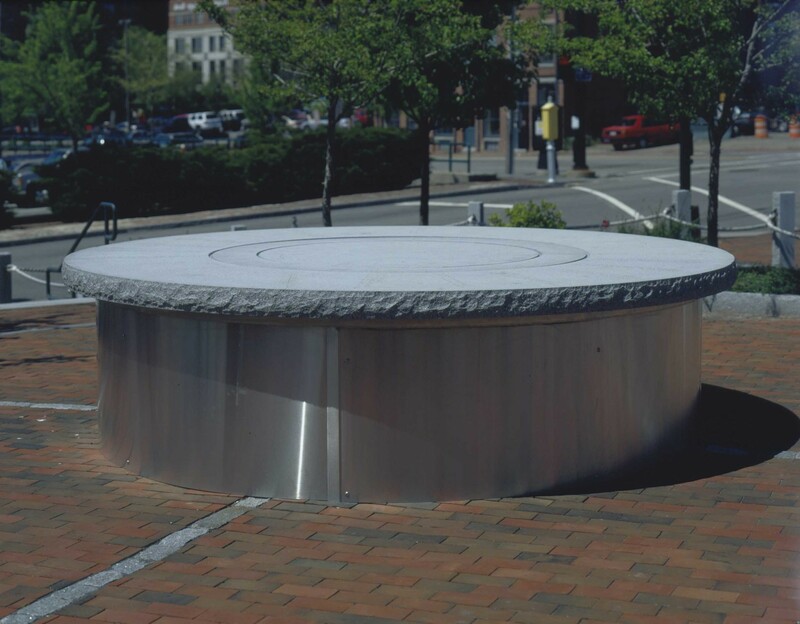 The site for the commission is a small circular public plaza located on what is historically known as Gorham’s Corner at the intersection of Center Street, Fore Street, Pleasant Street, Danforth Street and York Street in Portland. While Gorham’s Corner was a predominantly residential community for Irish immigrants during the turn of the century, diverse residents and restaurants came to define the intersection. The sculpture responds to the history of the site, the intimacy defined by the landscaped plaza and the neighboring community. It is intended to create a communal place, a table where one remembers ordinary people who history has forgotten and those who are remembered in the names of buildings, streets and parks. This combination of personal and public memory acknowledges the complexity of the legacy of Gorham’s Corner and of history itself. In the center of the plaza a large circular granite table is situated so that the center of the table and the adjoining ring spins freely, like an interwoven lazy-susan. 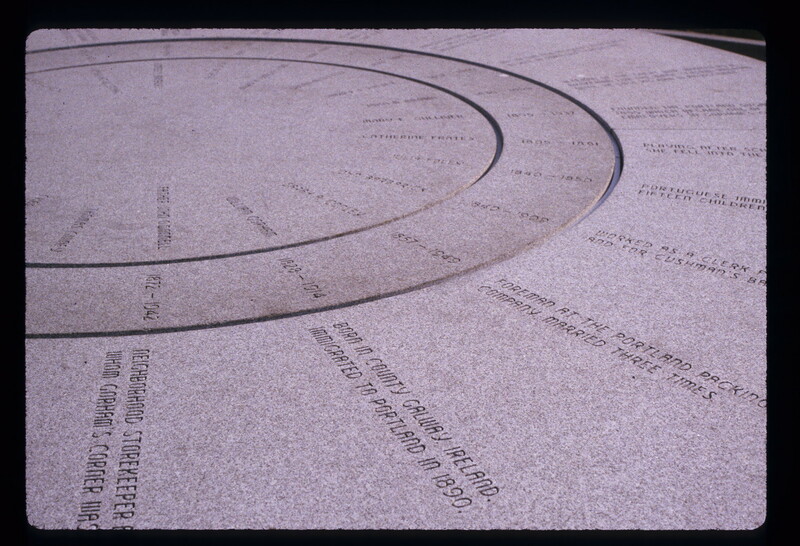 The names and histories of both common and historically prominent individuals are sandblasted into the surface of the granite table in a radiating pattern from the center circle, followed by the individual’s date of birth and death on the second ring and a brief personal history of each individual on the third and outer ring. 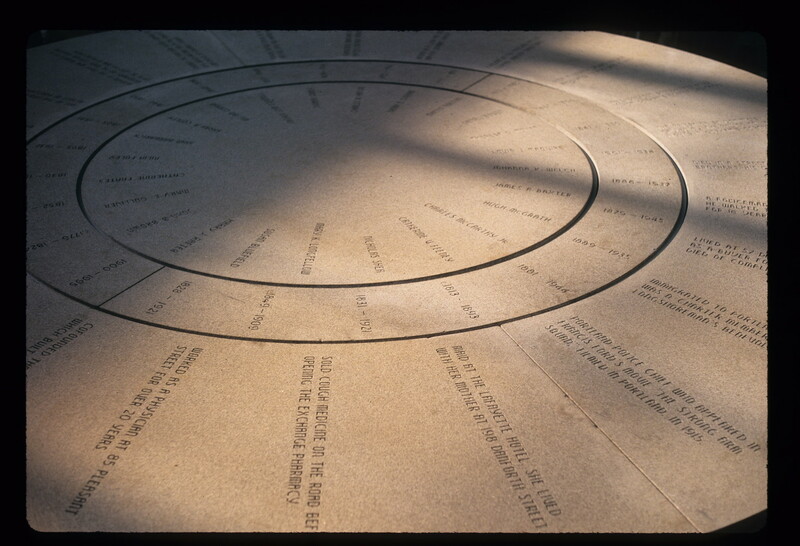 Viewers interact with the sculpture by rotating the granite disks, so that the names, dates and histories spin independently of each other, thus altering and fragmenting history. While viewers play with falsifying and fictionalizing history, they also attempt to solve the puzzle by aligning the three disks to reveal the true story.